Hidden From View Behind Brick Columns on 1. 43 Tranquil Acres is Situated An Elegant Custom Built 6,133 sqft.. Brick Georgian , Finest Craftmanship, Wonderful Circular Flow Design, Heavy Millwork, Double Entry Doors with Stain Glass Window open into an Extraordinary 23′ x 10′ Entrance Hall with Soaring Ceilings & Scenic Views of the Grounds ,Beautifully Appointed, 5 Member Crown Molding & Chair Rail, Rare 9′ Ceilings on Both Floors, All Sizable Rooms, Refinished Hardwood Floors Throughout, Romantic Formal Dining with Gas Fireplace, Totally Remodeled Eat- In Kitchen in 2008 with Sitting Area Around a Gorgeous Stone Fireplace, New Multi-Level Islands with Expensive Brazilian Granite, High End Audio/Video Equipment and Wolf Appliances + Gas Cooking+ Sub-Zero Frig/ Freezer+ 2 Convenient Drawer Refrigerators , Walk-in Pantry & Butler’s Pantry. 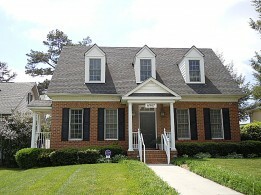 Rare & Private First Floor Master Wing with Gas Fireplace, Private Screen Porch & Both Huge Bath + Closet, 2nd. Floor presents 5 Nice Size Bedrooms w/3 Full Baths + Media Room + Hidden Retreat Room off 2 Bedrooms & Wide Staircase to Walk-Up Attic. Outdoor Fun w/ Spa Hot Tub , Shower, Multi-Level Bench Seating + Pet Invisible Fence!